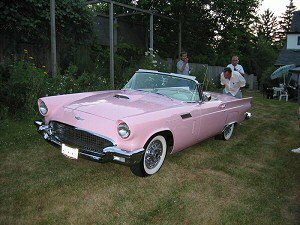 Every time he walked into the garage he said that the sight of the T-Bird really got under his craw so he put it in the drive-way of his house with a “ For Sale “ sign on it. A couple from New York on vacation happened to drive by and they bought it. It had only 4,203 miles on the odometer. The gentleman from NY drove the car home with the hardtop on, upon arrival he removed it, took out the port holes, pushed a round wooden pole through it and hung it on the garage wall, this was in 1959. I purchased the car in 2001 and I lifted the hardtop off the garage wall where it had sat wrapped all those years. It was just like brand new. 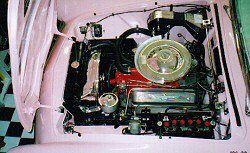 The late owner had looked after the car as you would a baby, though it wasn’t a ‘trailer Queen ‘ car, it could have passed as one, everything was detailed, and all original, except the stainless steel exhaust and the Kelsey Hayes wire wheels. The odometer read 65,335 miles. I am assured by his wife he never took it out if it looked like it might rain, but he did drive it to many local shows. The only things I have done to the car was to have the original paint ( which had crazed ) taken off to bare metal, the body shop didn’t have to do any body repair or rust repair anywhere, there were no dents or filler, the car was never hit. I had the body shop do four primer coats, two base color and six clear coats 12 coats total and every one sanded down. It now looks like a sheet of glass. 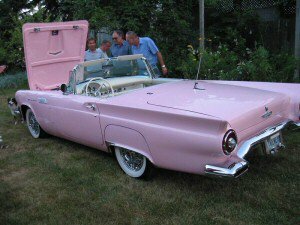 I took out the original radio and fitted a modern Thunderbird AM/FM, Cassette & CD player, WWW radial tires with radial shocks. The white soft top was in good shape but being Vinyl it had after all those years changed to a creamy color. I replaced it with a Hartz stayfast black top. There are two unique things about this car in that the gearshift knob, window crank knobs, seat adjuster knob, signal lever end knob, and the seal around the dashboard where it curves over the steering column are all white. All other ‘birds I have seen are black. The original owner in Texas said that this is how it was in the showroom , so by his words this was factory. I have the original invoice. The other uniqueness is that there is a plaque on the firewall commemorating the fact that the ‘ Beach Boys, “Frankie Valli,” and the “ Temptations ” all singly rode in the car when taken to the stage in Buffalo, NY for a concert they were giving in 1989 and 1990.